The quote above has often been attributed to Albert Einstein although there is some controversy regarding whether he ever actually made this statement. However, regardless of the historical accuracy of the quote, it is undeniable that a solid understanding of compound interest is a requirement for basic financial literacy. Exponential functions like compound interest are not automatically intuitive for most people, especially when interest rates are microscopic, as they have been in recent years. Yet the principle is relatively simple and should be a requirement for high school graduation. The book is primarily intended to encourage young people to harness the power of time to create investing “snowballs” – a term associated with Warren Buffett’s life story of starting with small amounts of capital and watching it snowball into tens of billions of dollars. A refreshing aspect of the book is that Maya understands that buying a stock is more than simply buying a virtual “piece of paper” with quotes that squiggle around every day. She clearly understands that ownership of stocks is simply a proxy for ownership of the underlying business. Furthermore, she seems to like the process: “The world gives you clues and an investor is like a detective who has an endless series of mysteries to try and solve.” This is precisely the task of an intelligent investor. Investors take the accumulated worldly wisdom they have obtained in life and apply that to the analysis of companies within their individual circles of competence, and then make judgments regarding the relative attractiveness of businesses they can understand. One of the best ways to get young people interested in investing is obviously to focus on companies that they personally are familiar with and understand. All teenagers are familiar with companies such as Disney, Coca Cola, Starbucks, Amazon, McDonalds, Wal-Mart and many more. Maya advocates something along the lines of the classic “Peter Lynch” approach of buying what you personally know, with the caveat of digging into the fundamentals. The book covers some basic financial concepts and primarily relies on the use of tools such as The Motley Fool and Morningstar websites rather than going directly to the SEC filings. This seems understandable especially for younger investors, but teenagers approaching the end of high school who are serious about investing should begin to delve into primary sources such as SEC filings in addition to information services like Morningstar. The book also contains interesting interviews with established professional investors as well as individual investors with many years of experience. This is important because the life experience of a fifteen year old author is inevitably going to be limited. By going to individuals with many decades of experience, Maya gives the reader a sense of the process serious investors go through when selecting specific investments. She also spends some time discussing socially responsible investing, a topic likely to resonate with idealistic young people who wish to invest their money only with companies that share their values. Although only a certain percentage of young people are going to be interested enough in business to delve into the details required to make investments in specific companies, all teenagers could greatly benefit from the fundamentals presented in this book. There is nothing wrong with investing money passively in broad based index funds over a long period of time. Although stock valuations are quite high today, someone just starting has the advantage of time and should view any temporary declines as buying opportunities since they have the majority of their life (and earnings potential) ahead of them. Perhaps the best way to help a young person start to invest is to fund a Roth IRA account when they begin earning their own money. Most teenagers are unlikely to want to plow all of their earnings into investments but suppose that a teenager earns $5,000 over the course of a year in part time jobs. If the teen can be persuaded to save perhaps half of this amount, or $2,500, his or her parents could match that amount and invest a total of $5,000 in a Roth IRA account. Roth IRAs are ideal for those who have many decades ahead of them. If a fifteen year old invests $5,000 this year and achieves a real compounded return of 5 percent, that $5,000 will grow into purchasing power of over $57,000 in 2018 dollars by age 65 in fifty years, and no taxes will be owed when these funds are withdrawn in retirement. 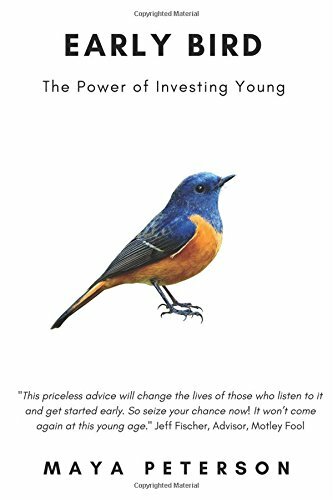 Early Bird is an impressive achievement and would make a good gift for a young person who is interested in investing. Disclosure: The Rational Walk received a review copy of the book.